The brown marmorated stink bug is an invasive pest on the move. There’s a new bug in town, and it may be visiting a field near you this summer. The brown marmorated stink bug (BMSB) is an invasive pest from Asia that was first detected in Pennsylvania in the mid-1990s and has been on the move. It has spread rapidly — now confirmed in 42 states and two Canadian provinces. BMSB often causes significant damage to fruit and vegetable crops, but also can do economic damage to field crops; soybeans are a preferred host for the pest. In some Mid-Atlantic states, BMSB now is the predominant stink bug species in the soybean crop. “BMSB is an ‘edge’ pest,” says Ames Herbert, entomologist with Virginia Tech’s Tidewater Ag Research and Extension Center. “BMSB infestations are the greatest on field edges bordered by woods.” He points out that BMSB counts rarely reach economic thresholds in the middle of fields; a single field-edge insecticide treatment often can successfully battle the bug. Timing is critical. Scouting should begin during the R4 stage of soybean development, since the pest has an affinity for soybean pods and can cause seed quality and yield losses. Laura Jesse at Iowa State University’s Plant and Insect Diagnostic Clinic points out that soybean fields can host a number of different members of the stink bug family. “There are some predatory stink bugs that are brown in color, and are considered beneficial insects,” she points out. BMSB has a mottled brown appearance with alternating black and white markings around the perimeter of the abdomen. “There also is a white band on the antennae that helps identify BMSB,” she adds. Smart phone scouting. 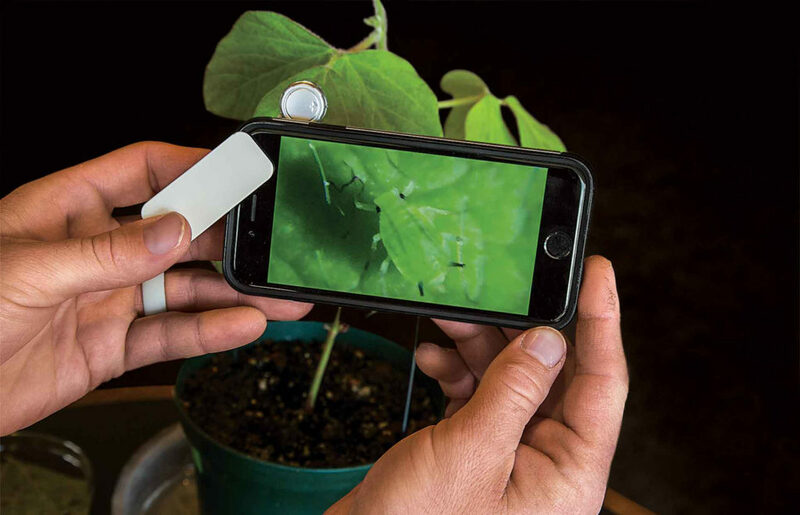 Summertime crop scouting has long depended on some pretty low-tech tools, starting with a wide-brimmed hat and a hand-held magnifying lens. These days, however, sophisticated digital devices such as smart phones and tablet computers are finding their way into scouting tool kits across the Corn Belt. The price for this new technology can be amazingly affordable. The portrait of the soybean aphid above was made with a clip-on Beileshi 60X micro lens placed over the camera lens on a smart phone. The tiny zoom magnifier features its own LED white or UV light sources, and was purchased on Amazon for a mere $7.99. As BMSB continues to spread into new areas, the soybean checkoff funded a publication about BMSB biology and management to help growers prepare. It includes recommendations for scouting and treatment. You can download the document when you visit unitedsoybean.org. Oysters are coming back strong in the Chesapeake Bay. Cotton row spacings get a new look.